My organization, the American Academy of Hospice and Palliative Medicine (AAHPM), found that Twitter is the best platform for our membership. Yes, we have a Facebook page, but Twitter is where our members are most active and responsive. Our membership is made up of more than 80% physicians, so they don’t have a lot of time to read lengthy copy; they need bite size info to read and share fast. Our focus on Twitter has erupted and continues to grow exponentially each year. Using the following five tactics, we have increased our impressions at our annual meeting from 13 million to 25 million in just one year. In the plenary room at our annual meeting, we reserve the front three rows for attendees who love to tweet. It’s a simple as printing out a piece of paper that has the Twitter logo and the word “Reserved” typed out. Our big attendee tweeters usually flock to the front anyway, but this easy-to-implement idea shows that Twitter is a big deal there. These rows aren’t monitored so technically anyone can sit there, but it makes our followers feel special and appreciated. Two words. Twitter. Wall. We rented a few flat screen TVs and projected via the live streaming program strea.ma. The program pulled all tweets directly from Twitter that used our annual meeting hashtag (#hpm17, or mentioned our organization, @AAHPM. Attendees LOVED it. We really played it up by creating a “social media lounge” which included the Twitter Wall, charging stations, and comfortable seats for attendees to utilize. We even witnessed people having races to see whose Tweet would appear on the wall first. Watching our attendees’ excitement and engagement was a blast! Instead of having an open mic for attendee questions during a plenary session, we created a new hashtag for users to tweet their questions called #hpmq, meaning “hospice and palliative medicine questions”. We identified volunteers, called Tweet Pros, to be on stage and select which questions would be answered. Our Tweet Pros would then ask the question on stage to the presenter, which helped us get through more questions than live mic questioning would allow. (With only 140 characters, the questions have to be short!) We received a little push back the first year we did this, but now our attendees know this is the standard. No, we don’t mean pay your attendees to sign up for Twitter. What we mean is give them a reason to be on the social network and tuned in. A lot of content and bite-sized education is tweeted at our meeting, but that may not be enough reason for people to come. This year, we introduced “pop-up surprises”. Each day, we planned a limited-quantity giveaway in a secret location which we only promoted on Twitter and through our mobile app. We would tweet out a picture of what we were giving away (socks, candy, etc.) and where we were located. It was a way to celebrate those who are actively involved on our social platforms. Our attendees loved it and our Twitter following grew as a result! 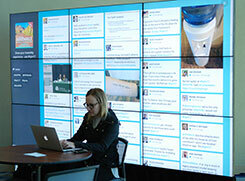 When onsite at your conference, the last thing you want to worry about is coming up with clever content to tweet. Prior to our conference, we come up with a variety of tweets, reminders, and congratulations that are easy to schedule utilizing Hootsuite. These tweets include topics such as, receptions, exhibit hall openings, award congratulations, starts of the plenary sessions, and much more. We include our conference hashtag in each tweet and mention our plenary speakers and award winners who have a Twitter account to gain more searches. We take our event’s time zone into account when prescheduling to ensure they get them at the right time while onsite. This quick idea is easy to implement and makes it look like your organization is at the top of their game! 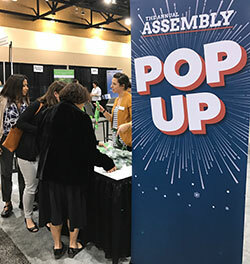 Now that you have some ideas to spice up social engagement at your annual meeting, I encourage you to get creative with yours! Social media should be a fun addition to your organization, not a burden. Stay active, share current information, and be sure to retweet often! To see all the activity that happened at this conference, search #hpm17 on Twitter.